BOZEMAN — When Andrew Santiago-Frangos came down the hallway with a slightly stunned look on his face, Montana State University associate professor Blake Wiedenheft recognized the same mix of emotions that he’d experienced more than a decade ago. Santiago-Frangos, a postdoctoral researcher in Wiedenheft’s lab, had just been notified that he had received the fellowship, he told Wiedenheft. By that, Santiago-Frangos meant the same fellowship that had launched Wiedenheft into one of the hottest fields in science in 2008. The award of $186,000 from the Life Sciences Research Foundation “may be the most competitive postdoctoral fellowship,” Wiedenheft said. Santiago-Frangos was selected from among 810 applicants for the three-year award. Since the award was established 36 years ago, LSRF has typically given out only about 20 fellowships per year. Santiago-Frangos’s funding is sponsored by the Simons Foundation. 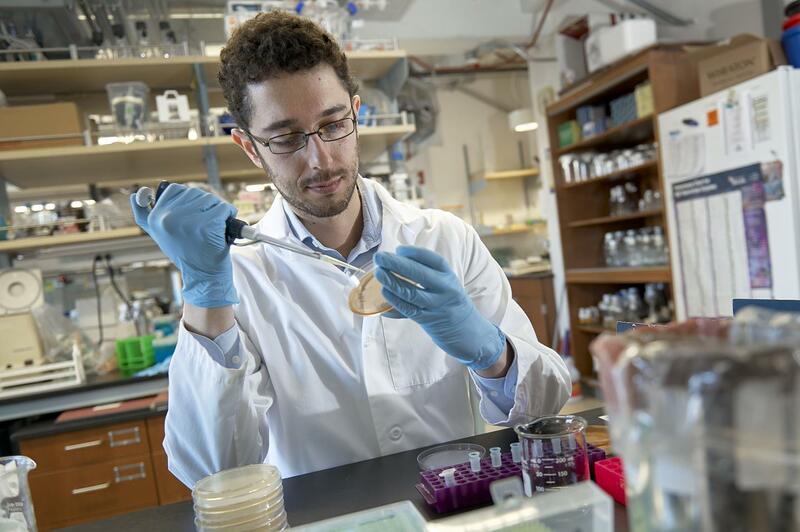 Santiago-Frangos, who grew up mostly in the Mediterranean island of Cyprus and earned his doctorate in biology at Johns Hopkins University, will use the fellowship to explore fundamental questions about the immune system called CRISPR — an acronym describing how bacteria incorporate fragments of viral DNA into their own genome as a way to recognize and fight viruses. Although much is known about CRISPR, including how to repurpose it into a precise tool for editing the genomes of such things as sheep and cultivated mushrooms, there remain intriguing questions about how bacteria recognize invading viruses, according to Santiago-Frangos. “There are still some outstanding questions concerning how the CRISPR system distinguishes between self and non-self,” Santiago-Frangos said. Using “optical tweezers” — precise beams of light that can hold tiny pieces of DNA and other molecules — as well as powerful microscopes, Santiago-Frangos hopes to observe how complex CRISPR molecules interact with viral DNA. Santiago-Frangos conducted his doctoral research in the lab of Sarah Woodson at Johns Hopkins. There, using a combination of biochemical and biophysical techniques, he conducted a detailed study of the structure and function of a protein that plays an important role in the stress response of nearly all bacteria. Becoming an LSRF fellow means that Santiago-Frangos will attend an annual conference with his fellow fellows. That’s a top benefit, according to Wiedenheft, who still keeps in touch with many from his 2008 cohort. Exchanging ideas and bonding with a select group of researchers “really broadened my scientific perspective,” he said. Wiedenheft, whose LSRF fellowship was sponsored by Howard Hughes Medical Institute, earned his doctorate at MSU while researching viruses that inhabit the boiling, acidic hot pools of Yellowstone National Park. That niche research launched him into a postdoctoral position at the University of California, Berkeley, in the lab of renowned CRISPR researcher Jennifer Doudna. The fellowship inspired him to reach for his fullest potential and gave him a stable foundation for conducting research, said Wiedenheft, who returned to MSU in 2012 and has since published several groundbreaking papers about CRISPR’s inner workings. The Wiedenheft lab is housed in the Department of Microbiology and Immunology in the College of Letters and Science and College of Agriculture.